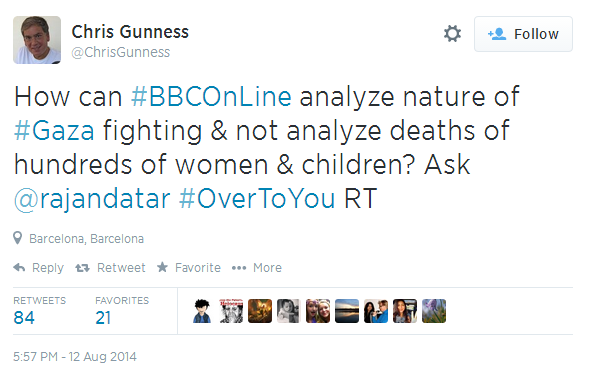 Not only has the BBC never bothered to explain to its funding public why an article written by its own Head of Statistics was so radically altered but it has also not returned to the subject of casualty ratios during the 2014 conflict in any meaningful way, preferring to quote UN supplied figures sourced from political actors and with no independent BBC verification of those figures apparent. One organization which has carried out meticulous identification of the names appearing on the casualty lists supplied by Hamas and additional actors is the Meir Amit Intelligence and Information Centre and it recently published its eleventh report on the topic – available here. Links to the previous ten reports can be found here. Notably, this latest ITIC report studies fifty names which did not appear on the lists of casualties supplied by Hamas. All of those 50 casualties belonged to assorted terrorist organisations and most of them were Hamas operatives. A media organization truly committed to accuracy and impartiality would clearly have made good on its stated intention to “return to this subject at a later date” in order to ensure that the information it continues to quote and promote is indeed accurate, that its rulings on complaints on the topic are fact-based and fair and that its impartiality is not compromised by the failure to provide audiences with accurate civilian/combatant casualty ratios on one side of the conflict – as was for example evident in the BBC’s recent prolific coverage of the conflict’s anniversary. Of course the longer the BBC fails to address this topic openly and honestly, the more it fosters the impression of a political motivation behind the both changes made to its August 8th 2014 article and its subsequent presentation of the subject of civilian/combatant ratios in the Gaza Strip. 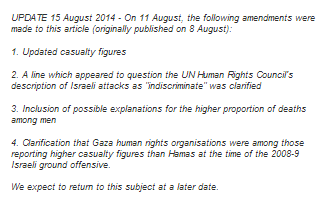 What connects Hamas supplied casualty figures to the BBC’s expedited complaints procedure? 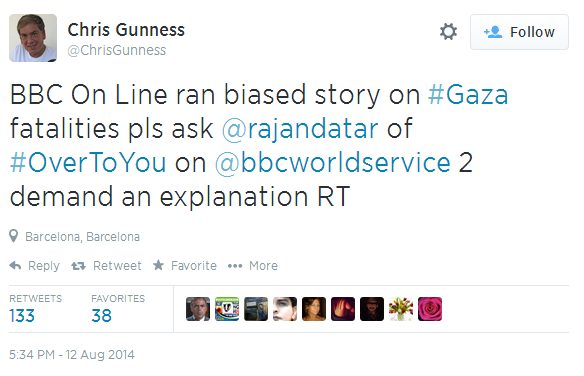 Will ex-BBC Gunness tell the Frontline Club how he got a BBC article rewritten? On July 29th the Frontline Club in London will hold the event described below. So who is scheduled to be on that “panel of journalists”? At the moment it appears to consist of two people. Readers considering attending the event and seeking advance insight into what they might hear from the generously portrayed Mr Blumenthal can find information collated by our colleagues at UK Media Watch here and at CAMERA here. A particularly useful research paper on Blumenthal’s book ‘Goliath: Life and Loathing in Greater Israel’ by Petra Marquardt-Bigman can be found here. 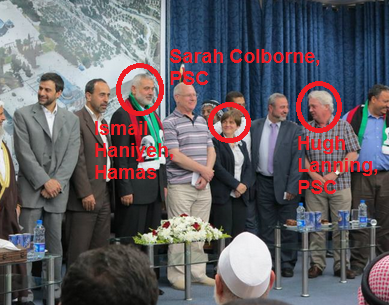 Those participating in the event might of course take the opportunity to ask Chris Gunness about his apparent role in instigating the politically motivated rewrite of the August 8th 2014 BBC article titled “Caution needed with Gaza casualty figures“. Licence fee payers in the audience and further afield would, after all, probably be very interested to learn about the potential for outside influence on BBC editorial decisions. The event will also be available live on the Frontline Club’s Youtube channel. In the first three installments of this post (see ‘related articles’ below) we documented BBC News website coverage of the first thirty days of Operation Protective Edge. 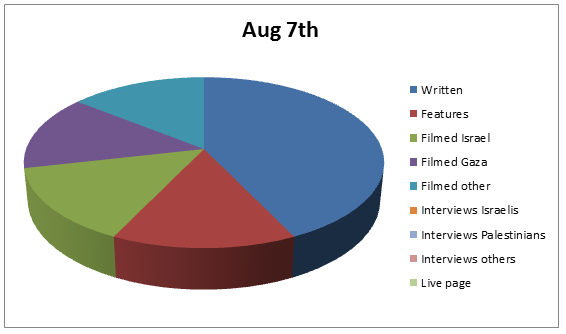 Part four relates to the next ten days: August 7th to August 16th 2014 inclusive. Content on the website included written news reports and written ‘Features and Analysis’ articles as well as filmed items presented as stand-alone reports and additionally often embedded into the written articles. Those filmed items also appeared on BBC television news programmes and hence give us an idea of what worldwide audiences were being shown and to what extent the BBC lived up to its claims of “equal coverage” of the two sides to the conflict. A small amount of content which appeared on the BBC News website at the time has since become unavailable, but below are the vast majority of the reports offered to the website’s visitors. We are not including here the many reports concerning demonstrations relating to the conflict in Europe and elsewhere which appeared on the Middle East page: that topic will be covered separately. 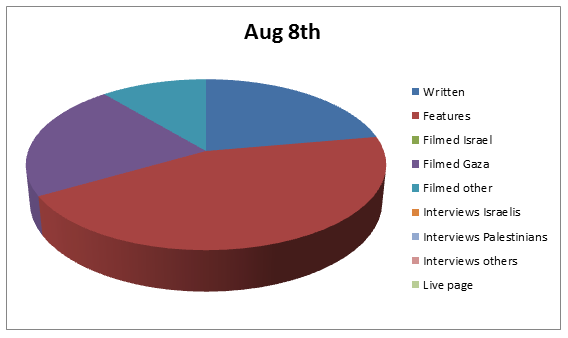 Also not included in this chapter are three separate filmed reports about NHS activities (delegations to the region, donations of equipment) which appeared on the BBC News website’s Middle East page on August 9th, 11th and 12th. Clearly the most striking aspect of this period of coverage of the conflict is the sudden decline in the number of reports produced by the BBC in comparison with the previous thirty days. Two factors contributed to that drop: like much of the foreign media the BBC apparently assumed that the August 5th ceasefire was going to hold and began moving journalists who do not normally cover the region, but had been ‘parachuted in’ to provide back up to its Jerusalem Bureau team, out of the area. Concurrently, the ISIS story in Iraq and Syria began to gather pace and resources were diverted to covering that issue. 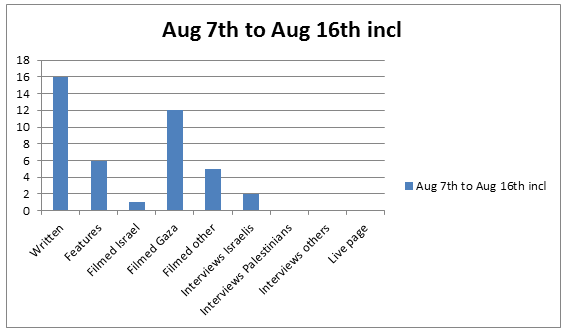 The most obvious effect of those changes is that after the withdrawal of Israeli ground troops from the Gaza Strip on August 5th and despite the breakdown of the ceasefire of that date and the continuation of missile fire into Israel, BBC audiences saw only one filmed report depicting the situation as far as civilians in Israel were concerned between August 7th and August 16th. They did, however, see twelve filmed reports from the Gaza Strip during that period. By August 16th visitors to the BBC News website (and television audiences) had seen almost three times as much filmed coverage from the Gaza Strip as they had from Israel (37.5 reports compared to 100.5) since the beginning of the conflict. The major theme dominating BBC reporting during the period from August 7th to August 16th remained the vigorous amplification of Hamas’ demands concerning the lifting of border restrictions and the construction of a seaport. Missile attacks on Israel were severely under-reported or ignored and ceasefire violations by terrorist groups downplayed or distorted. The amplification of the agendas of NGOs engaged in political warfare against Israel continued, as did the promotion of claims of ‘war crimes’. 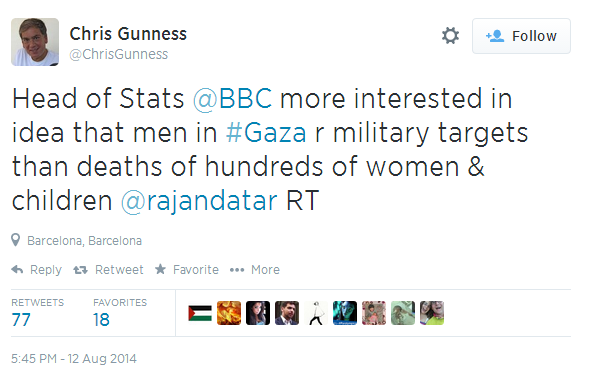 A particularly notable event during this period was the appearance of the article by the BBC News Head of Statistics on the issue of Gaza casualty figures after an entire month of context-free BBC citation of Hamas-supplied data. The fact that the article soon underwent changes which diluted its original message as a result of the application of outside political pressure is highly significant and of course reflects very badly on the BBC’s supposed commitment to accuracy and impartiality. 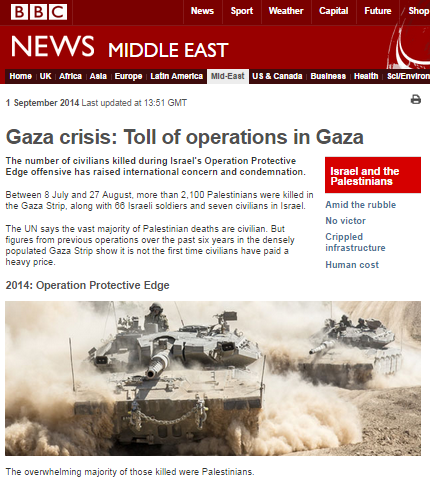 BBC’s capitulation to political pressure on Gaza casualty figures: tip of a bigger iceberg? 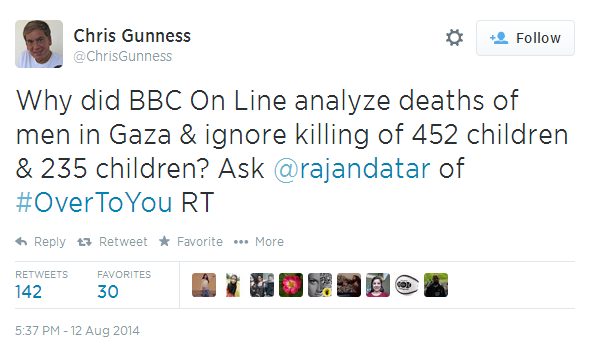 The saga of the BBC’s squeezy stance on the reporting of casualty figures in the Gaza Strip continues. 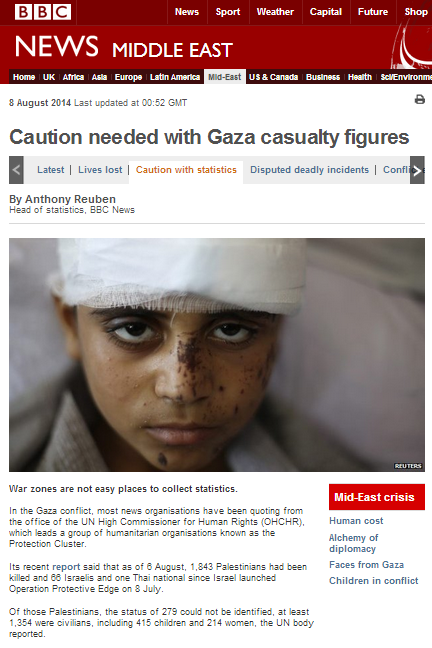 To recap the story so far; on August 8th the BBC News website published an article titled “Caution needed with Gaza casualty figures” written by the Head of Statistics for BBC News. Three days later, unannounced changes were made to that article – apparently as a result of pressure from campaigning actors including UNRWA spokesman Chris Gunness who reportedly told ‘Private Eye’ (print version only) that the article was “an appalling piece of journalism”. Only on August 15th – four days after amendments had been made to the article – was a footnote added informing audiences that changes had been made to its content. 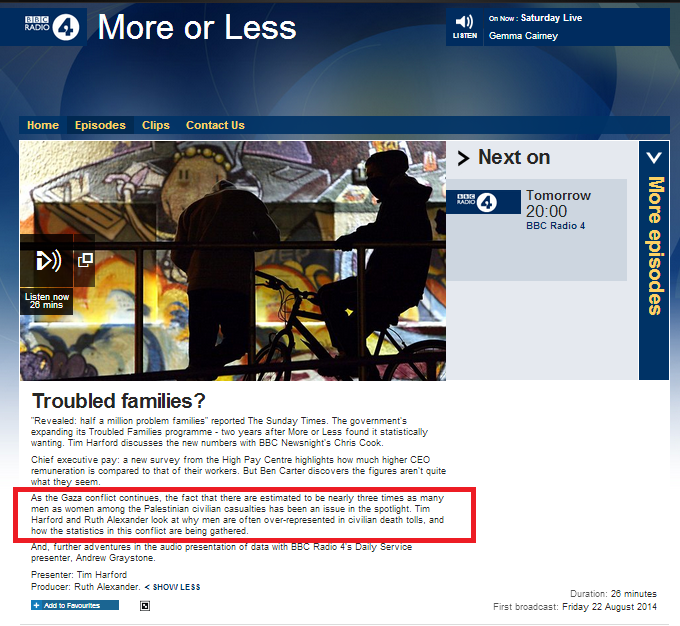 The BBC’s damage control continued in the form of a nine-minute item in the August 22nd edition of ‘More or Less’ on Radio 4. Since then, the BBC has continued to produce highly problematic content on the topic of casualty figures in the Gaza Strip during Operation Protective Edge. 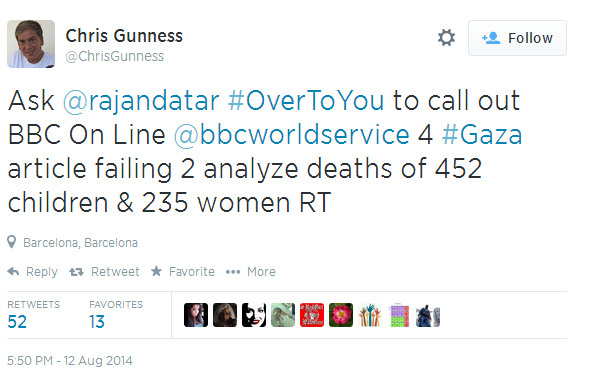 Not content with the censoring of BBC audiences’ access to statistical insight into the issue of casualty figures in the Gaza Strip, the Palestine Solidarity Campaign now seeks to restrict audiences’ opportunities to benefit from such analysis in the future. As is well known, the Palestine Solidarity Campaign’s faux ‘concerns’ about BBC impartiality and integrity are highly selective; only making an appearance when they are deemed a useful tool in that organisation’s anti-Israel public relations campaigns. Nevertheless, especially in light of the manner in which the BBC speedily capitulated to political pressure over the content of Anthony Reuben’s original article, it might not be in the least surprising to see it allow an opaquely funded fringe group, which provides support for a terrorist organization proscribed by the British government, dictate what BBC audiences can read see or hear. This latest in a long line of PSC actions is of course particularly interesting in light of the fact that only a couple of weeks ago Jeremy Bowen and John Lloyd were telling listeners to BBC Radio 4 that, with regard to complaints to the BBC, “Palestinians weren’t organized in the same sort of way” [as supporters of Israel] and “Palestinians weren’t geared to complain as Israelis and the Jewish diaspora were”. 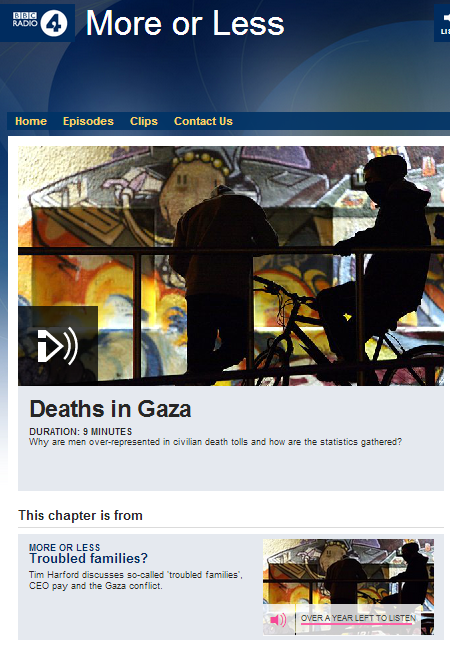 On August 22nd the BBC Radio 4 programme ‘More or Less’ included an item on the topic of casualty figures from the Gaza Strip which purported to provide listeners with information pertaining to the questions “[w]hy are men over-represented in civilian death tolls and how are the statistics gathered?” The segment can be heard here and the whole programme is here with the relevant item beginning at 13:23. After an introduction composed of statements from BBC news bulletins, presenter Tim Harford (also a Financial Times columnist) begins the item. TH: “The number of civilians killed in Gaza during the conflict between Palestinian militants there and the Israeli military has raised international concern and condemnation. A UN report estimated that between the 7th of July and the 20th of August this year there were 1,999 deaths in Gaza caused by the conflict. Of those killed, the UN estimate that 70% were civilians and of those thought to be civilians, approximately 250 were women, 450 were children and 700 were men. The figures, say the United Nations, are subject to change based on verification. The same UN report states that on the Israeli side, 64 soldiers have been killed and three civilians. As BBC Watch readers already know, the original article by the BBC News head of statistics underwent initially unannounced changes several days after its publication – apparently because its content displeased certain parties. Four days after those changes were made a footnote acknowledging them was added to the article as it appears online. The so-called “Independent Commission of Inquiry” was announced by the UN OHCHR on July 23rd after that body accepted a draft resolution proposed by Pakistan on behalf of the Organisation of Islamic Cooperation – the same organization which claims to have been the initiator of the ‘Goldstone Report’ and has pressed the UN to introduce a “global blasphemy law”. During the ‘debate’ on whether to establish yet another of its now infamous ‘independent’ inquiries, the UN HRC heard from assorted notable champions of human rights. “Syria said that extremist gangs of settlers had been allowed to abduct a Palestinian child and burn him alive, which had led to further massacres of the innocent, particularly women and children. Israel had continuously shown utter disregard for international law. The international community had to ensure that such crimes did not go unpunished. Syria supported the legitimate resistance of the Palestinian people. Sudan said with 650 dead, thousands wounded and many thousands more displaced, the violations committed by Israel represented a policy of racial and ethnic cleansing, a massacre and genocide at a time when mankind had rejected the racist law of the jungle and moved into a time of human dignity. The Council must recognize that Israel was an occupying power supported by a superpower that could do whatever it wanted. 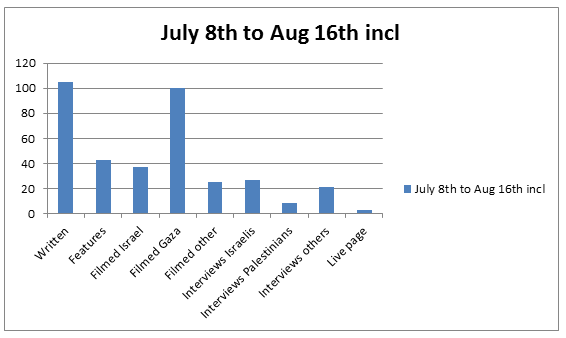 Ruth Alexander continues by bringing in another interviewee from an organization which – as we documented here last month – is both one of the primary sources of UN casualty statistics and is also engaged in lawfare against Israel. Like her colleague, Alexander breaches BBC Editorial Guidelines by failing to clarify that fact to listeners. Ruth Alexander then introduces a representative from yet another political NGO which is one of the UN’s primary sources, but does not inform listeners either of that fact or of B’Tselem’s political agenda. So what did listeners to BBC Radio 4 get in this nine minute-long item? Well, they learned for a start that the BBC is ‘squeezy’: it will amend an article written by its head of statistics not because it is inaccurate, but because of pressure from people who, for political reasons, don’t like what it says. It will then alter and add to that article to present a viewpoint more in line with its critics’ agenda and will even produce a nine-minute radio item as further damage control – because this is actually what Tim Harford and Ruth Alexander’s item actually is. Harford and Alexander have brought listeners interviewees from three organisations which are all connected but without informing audiences of their ties or of their mutual political agenda. Beyond several opaque references to “politics”, they have failed to clarify to audiences how civilian/combatant casualty ratios are used in the campaign of lawfare against Israel and to generate a specific climate of public opinion and they have failed to make any mention of the related directives issued by Hamas instructing that all casualties should be described as civilian. Remarkably too they have framed this issue as one concerning a civilian/combatant ratio caused by Israeli actions alone, with no information provided to listeners regarding the very significant fact that the practices of terrorist organisations in the Gaza Strip such as launching missiles (a significant proportion of which fall short) and storing weapons and explosives in residential areas and booby-trapping houses all cause civilian casualties which of course are then attributed to Israeli actions – as the BBC should know only too well. In addition to the fact that this programme will be available on the BBC website for the coming year, it will also be repeated on BBC Radio 4 on Sunday, August 24th at 20:00. It would of course be appropriate for its numerous failures to meet BBC Editorial Guidelines on impartiality to be corrected before that happens by means of the addition of full disclosure of the political agendas of its interviewees and their role in the lawfare campaign against Israel. The BBC’s funding public might also be interested in some frank disclosure concerning the editorial policies behind the growing list of BBC contributions (including this programme) to that same campaign. Contact details for ‘More or Less’ can be found here and the programme’s e-mail address is moreorless@bbc.co.uk . Readers no doubt recall that on August 8th an article titled “Caution needed with Gaza casualty figures” by BBC News’ head of statistics appeared on the BBC News website. Since its initial appearance, that article has undergone a series of alterations – including its date stamp – but no footnote has been appended to inform readers of the changes made. “Many factors could have contributed to high fatality numbers among men aged 20 to 29. Jana Krause, from the war studies department at Kings College London, says: “A potential explanation other than combatant roles could be that families expect them to be the first ones to leave shelters in order to care for hurt relatives, gather information, look after abandoned family homes or arrange food and water. She stressed that more work would be needed on the ground to determine why this group was over-represented in the casualty figures. “It should be said that while Hamas said only 50 fighters had been killed in 2008-09, some human rights groups operating in Gaza were reporting considerably higher figures. Clearly somebody was unhappy with the wording of certain parts of that article. Notably, the reference to the UN Human Rights Council and the doubt expressed regarding that organisation’s allegations of “indiscriminate” Israeli attacks has been completely erased. In addition, passages have been added and wording changed in a very transparent attempt to create the impression that the over-representation of young men among the casualty figures in the Gaza Strip might not be the result of their being members of terrorist organisations, but because they popped out to the corner shop to buy milk. The bulk of the changes to this article are dated August 11th. 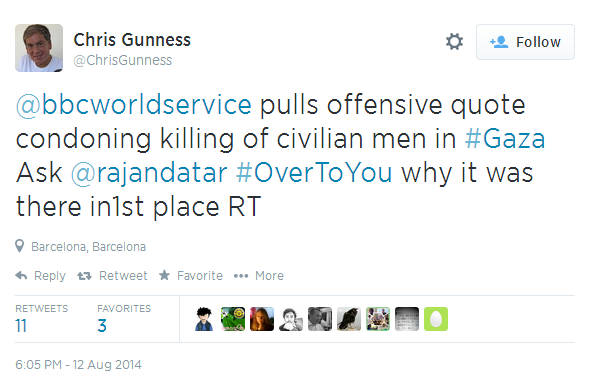 However, the UNWRA spokesman Chris Gunness sent a series of consecutive Tweets apparently relating to the same article which are date-stamped August 12th. In addition to Anthony Reuben’s article, readers will recall that an additional one also appeared on the BBC News website on the same morning of August 8th under the title “Gaza conflict: The hundreds who lost their lives“. Notably, whilst the former article no longer appears on the BBC News website’s Middle East page, the latter one does. Whilst the inaccuracies concerning Israeli casualties in that article have not been corrected, another undocumented stealth change has been made. In the article’s original version, that quote was different to the format in which it appears now: it originally quoted Reuben’s above reference to the UN Human Right Council’s allegations of “indiscriminate” attacks. So perhaps the BBC would like to clear up this little mystery for us. Why were those changes made three days after the article was published? Why is there no notification to readers that amendments have been made? Why has all mention of the UN HRC been expunged from this article and why have efforts – albeit very clumsy ones – been made to change the ‘take-away’ message to BBC audiences regarding the over-representation of men of fighting age among the Gaza casualty figures? And of course one other very obvious question remains: who is pulling the BBC’s strings? 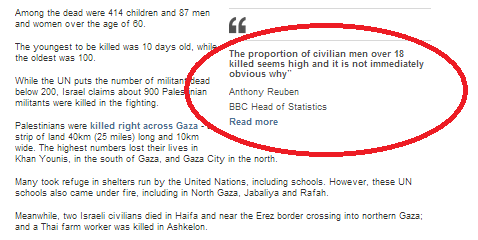 On August 8th the BBC News website published an article in the ‘Features & Analysis’ section of its Middle East page written by the head of statistics for BBC News, Anthony Reuben, and titled “Caution needed with Gaza casualty figures“. Many readers are probably asking themselves what took so long. After all, the BBC had maintained an across the board policy on all its platforms of blindly quoting casualty figures provided by Hamas and/or assorted political NGOs for a whole month before the appearance of this article and the horse definitely long since bolted before this ‘closing the stable door’ article appeared. However, Reuben’s report does make some valid points. Unfortunately, the article also fails to adequately address many other crucial points. He goes on to provide a link to UN OCHA’s report of August 6th but apparently has failed to recognize the fact that – as was reported here on July 13th – those “humanitarian organisations” which provide UN OCHA’s data are in fact NGOs with a political agenda which includes – as was reported here on July 18th – a campaign of lawfare against Israel with a vested interest in the inflation of civilian casualty numbers. The very fact that a UN body works with such NGOs and amplifies and enables their agenda should be a matter of interest to discerning journalists. It isn’t, of course. Neither does Reuben appear to make the connection between the already partisan stance taken by the office of the UN High Commissioner for Human Rights which – even before the hostilities have ended and the picture has become clear, has repeatedly voiced evidence-free accusations of ‘war crimes’ – and its adoption and amplification of figures promoted by political NGOs. Reuben cites and links to the recent New York Times report on the topic of casualty figures, but fails to note that article’s inadequacies. Likewise he fails to bring to audience attention relevant issues recently noted here such as summary executions carried out by Hamas, the use of human shields, casualties from shortfall missiles and Hamas’ use of child soldiers. The ITIC has to date analysed some 450 names from the casualty lists provided by the Hamas run Gaza health ministry and their findings can be seen here and here. Despite its shortcomings, Anthony Reuben’s article is of course a welcome – if very tardy – step in the right direction as far as the BBC is concerned. It would of course be appropriate for such information to be made available to BBC television and radio audiences in addition to website users and for a link to this article to be standard insertion into all written BBC reports citing casualty figures. 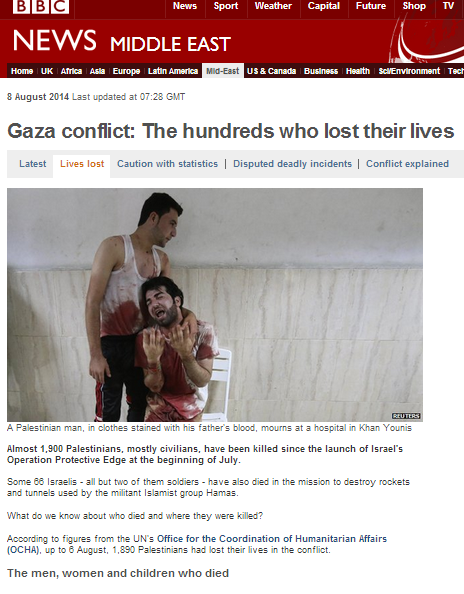 However, also on the morning August 8th, the BBC News website’s Middle East page published another article titled “Gaza conflict: The hundreds who lost their lives“. 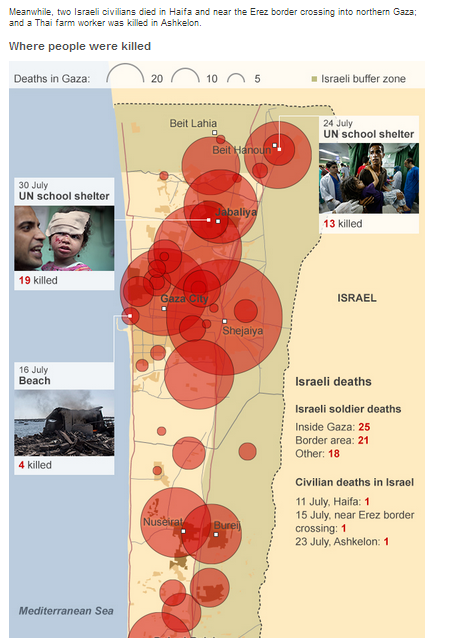 Remarkably, that article is devoted entirely to largely graphical representation of the same UN OCHA statistics which the other article states must be treated with caution and it egregiously erases all mention of the crucial context of attacks by terrorists on Israeli forces operating in the Gaza Strip. The article also includes some glaring inaccuracies with regard to Israeli casualties. Jul 15, 2014 – Dror Hanin, 37, of Beit Aryeh was killed near the Erez Crossing after suffering a direct hit from a mortar fired by terrorists in the Gaza Strip, while delivering food to soldiers there. Jul 19, 2014 – Ouda Lafi al-Waj, 32, was killed and three members of his family were injured, when a rocket fired from the Gaza Strip struck a small Bedouin settlement near Dimona. Jul 23, 2014 – Narakorn Kittiyangkul, 36, from Nan’s Pua district in Thailand was killed by a mortar fired from Gaza while working in a greenhouse in one of the Israeli communities in the Ashkelon Coast Regional Council. Dimona is nowhere near Haifa and the Ashkelon Coast Regional Council (Hof Ashkelon) is not the city of Ashkelon. One 70 year-old lady did die in Haifa when she collapsed due to a heart attack whilst trying to reach the safety of an air-raid shelter during a missile attack on July 12th and an American tourist in Jerusalem also died in similar circumstances. With the BBC having heavily promoted the view that rioting in Jerusalem and Judea & Samaria was a reaction to Israeli actions in the Gaza Strip, one might perhaps have expected to see the 29 year-old victim of the August 4th terror attack in Jerusalem, Avraham Walles, included on the BBC’s Israeli casualty list. The BBC has throughout the last month frequently told audiences that Israeli casualty figures are “nothing remotely like the losses on the Palestinian side“. It would therefore not have appeared to be too difficult a task to at least report them accurately, especially as – unlike the situation on the Palestinian side – the precise information is freely available in the public domain. 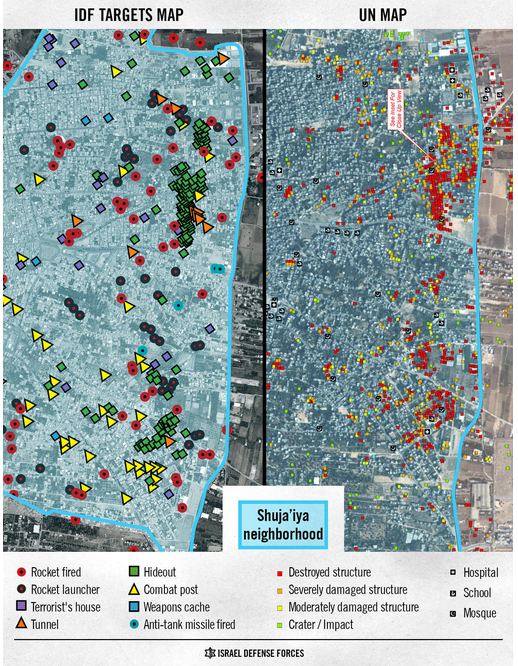 The importance of casualty figures in the Gaza Strip is not just one of statistical accuracy regarding civilian and combatant deaths; it is relevant because the figures presented are used as ammunition in the lawfare campaign which complements Hamas’ armed campaign and as a means of influencing public opinion worldwide. For that reason it is vital for the BBC to present its audiences not only with numbers but – if they are truly to be able to understand this particular international issue – with factual information on the methods and political motives of the organisations gathering the statistics and insight into the ways those figures have been presented and used to frame a specific view of this conflict – including, of course, by the BBC itself.